A derecho (pronounced dare-ay-show) is a long-lived straight-line high wind event caused by a line of severe thunderstorms. It differs from typical thunderstorm lines by its rapid speed of movement and the existence of highest wind speeds well behind the gust front, rather than at the gust front. The highest wind speed which can exceed hurricane force (greater than 65 knots, or 73 mph). 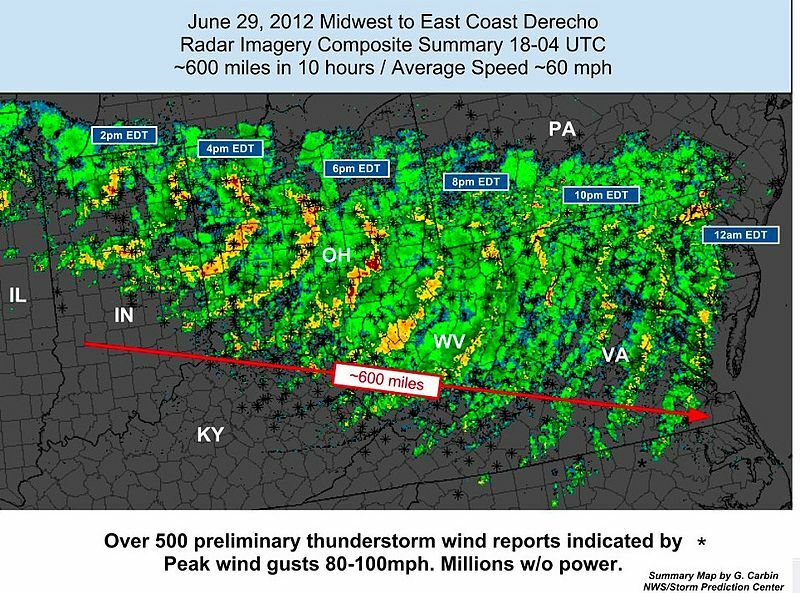 Derechos typically produce widespread wind damage, and the June 29, 2012 derecho event in the Eastern U.S. (see image above), while not exceptional for the wind speeds it produced, was indeed unusual for affecting such highly populated areas which resulted in power outages to millions of people. As is the case with almost all severe thunderstorms, derechos form in unstable airmasses, near the boundary between warm and cool airmasses which causes considerable vertical wind shear. The derecho was first described in the meteorological literature in 1888, describing an Iowa event in 1877. There is no evidence that derecho events have become more severe with global warming, probably because the existence of cool air is just as important as warm air for the formation of derechos: it is the temperature contrast which is important. One of the most severe derecho events occurred in 1977, with a peak officially recorded wind speed of 115 mph in mostly rural areas of northern Wisconsin and Minnesota. The June 29 2012 event had a highest (unoffical) recorded wind speed of 92 mph. Unlike tornado events which peak in the late afternoon and early evening, derecho events are just as frequent at night as during the day.